Throughout my career, there have been many situations where I wished I were a graphic designer or that I had one who was just sitting around waiting for me to make requests that they could design quickly and for free! So far, my fairy godmother has not granted that wish…either one. Marketers feel the pressure everyday to include impactful images in everything we do. Did you know that 90% of information transmitted to the brain is visual?Visuals are processed 60,000X faster in the brain than text. Additionally, posts with visuals receive 94% more page visits and engagement than those without. When you are a non-designer without a designer on your team, stats like that can be overwhelming! Luckily, there are many tools available to non-designers that allow us to create professional looking infographics, photos, and images for social media posts, websites, blogs, presentations, etc. Here are six that I have found useful. In September, I attended HubSpot’s Inbound 2014 and that is where I learned about Canva. Canva is a free, easy to use tool that allows the user to create many different types of graphics quickly and easily. There are templates available for a variety of social media posts, presentations, posters, email headers and more. You can also create your own custom templates. There are tons of backgrounds, fonts and images to choose from but you can also import your own. Some backgrounds and photos cost $1 to use but there are many free options. If you’re always looking for better-than-stock photography stock photography, this service is for you. For the price of providing your email address, you will receive a monthly package of stock photos. My first package was great. I could imagine using all of them. And if you’d like more, sign up for their premium package for $10 per month and get access to their entire library. Piktochart is another free option that allows the user to create infographics with simple drag-and-drop functionality. If the free version doesn’t provide all of the tools you need, there are three fee-based options. Prices range from $14 per month to $29 per month depending on the payment schedule. The charts are created from data that you import or create from scratch. If you change the data in the table, your infographic is automatically updated. There are many themes to choose from and a wide variety of icon-type graphics. The charts are created in modular way allowing you to add and remove content blocks. I also learned about Inforgr.am at Inbound 2014. The free version allows you to import a spreadsheet and turn it into an infographic or chart. It includes more than 30 templates and the ability to share your graphic or embed it in a blog post or on your website. If you want to print your graphic, a pro version is available for $15/month. It allows you to download your graphics to PDF or PNG files. There is also a third option called white label for $42/month that includes everything in the free and pro versions plus the ability to add custom logos. Infogr.am is also table-based which makes it easy to edit and create. It’s as easy as clicking on a design and then adding your own text. The range of charts available includes word clouds, tree maps, progress charts and other picture-type options. You can also add maps, video, text and images to the graphics you create. Here’s another site with a free option and the paid option is only $3/month! Easel.ly offers thousands of free templates and design objects users can choose from or you can upload your own background image and start from scratch. It is really easy to use and allows the user more flexibility in design than some of the other sites. It’s as easy as dragging and dropping. You can complete your project in a matter of minutes! Last but not least is PowerPoint. Many of us already have and use PowerPoint but are not aware of the SmartArt capabilities. While the graphics are not quite as polished as some you can create using the other sites I’ve shared today, sometimes PowerPoint provides exactly what you need for the particular project and audience. From the navigation bar, choose charts or SmartArt and a wizard walks you through the entire process. Creating professional-looking, impactful images that convey a remarkable message doesn’t have to be difficult or expensive. So the next time you find yourself wishing to be a graphic designer, don’t panic! 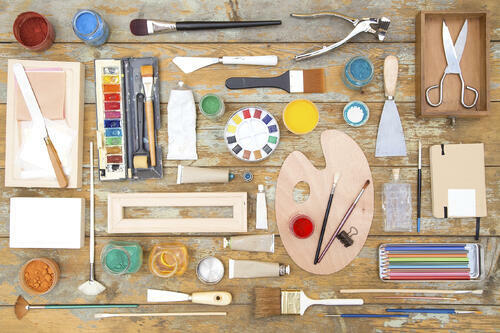 Try one of these tools and watch your design confidence grow.